As its MSRP suggests, the HD1 has plenty to offer apart from the Sennheiser brand name. For one thing, these cans feature a closed-back, around-ear design, which from my experience offers a much more comfortable listening experience than on-ear headphones do (though if you prefer on-ear headphones, you can save $100 and go for the on-ear variant of the HD1). The ear cups are covered in leather and padded with memory foam, too. The HD1 uses Bluetooth 4.0, can pair with devices via NFC, boasts NoiseGard hybrid active noice cancellation, and promises 22 hours of battery life. Beyond the listening experience, the HD1 uses two microphones to block external noise during phone calls, comes with a carrying case, and has a two-year warranty. 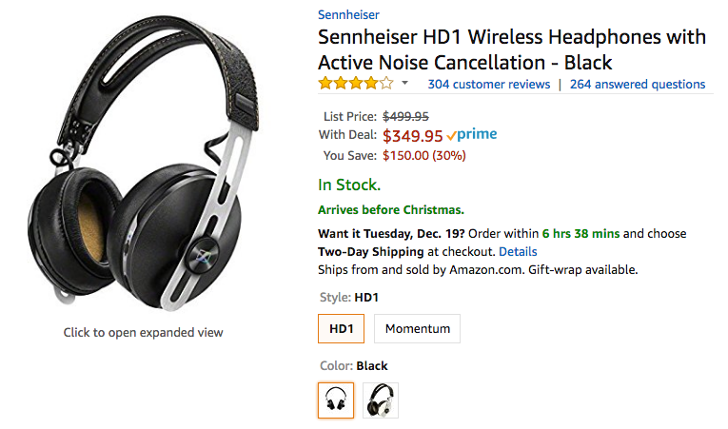 In September, we saw the HD1 go for $399, which was the lowest observed price for the headphones on Amazon at the time. Back then, only the black version was discounted. This time around, the new low of $349.95 applies to both the black and ivory versions. If you prefer making a purchase from Best Buy and don't mind spending a few more pennies, the HD1 is going for $349.98 there, though there's no in-store pickup option and the deal applies only to the black version. For those of you with discerning ears, a taste for the premium things in life, or an itch to splurge, the HD1 is worth consideration. At the very least, give this post some social shares to give your friends and family a subtle hint at what you might appreciate receiving this holiday season.